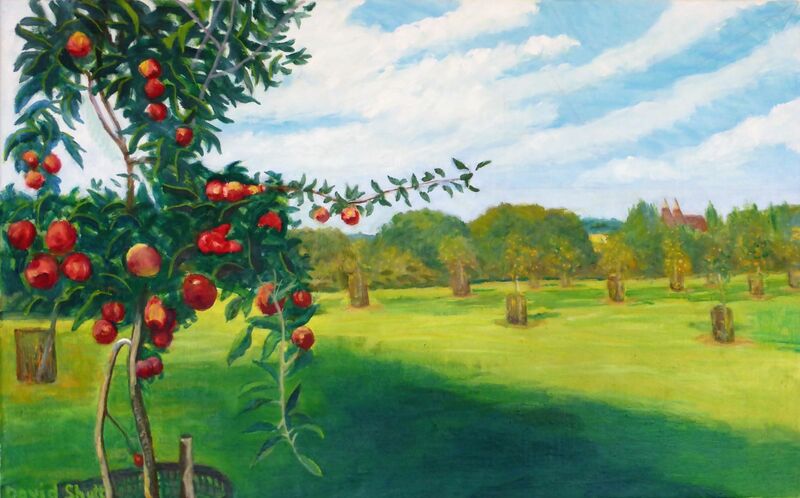 A summer exhibition of recent paintings by David Shutt (b.1945) concentrating on the theme of 'Trees'. Please note, the gallery will be closed from 6-20 August for a summer break. There is a beautiful alabaster “Madonna and Child” in the British Museum dating to AD 1350. It is of English origin though acquired from a convent in France in 2016. Whilst drawing from it I realised that the head of the Rod of Aaron which she holds opposite the Christ Child supported on the other arm, is enclosed in pentagonal flowers. It is a putative dodecahedron, the “divine” platonic solid which is composed of 20 five sided pentagons. Pentagonal structures were frequently used by the medieval master masons: one is in the gothic tracery of a window in Canterbury Cathedral. You can’t see it in my painting of the plane tree which it faces because its luxurious autumn foliage obscures it. I rather wish it hadn’t but that trajectory did most justice to the tree, with the beautiful colour of the Caen stone showing through. I wonder if the plane tree’s life precedes the life of the Cathedral? It may have served the same function as the ancient yew trees in English churchyards which sheltered the early Christian missionaries as they proselytized beneath them, which made them a sacred space (probably adopted from pagan beliefs) and hence the location for the early churches. The plane tree was regarded as an icon of wisdom in ancient folklore. In my mind the Rod of Aaron belongs with the Green Man (there is one on the bosses in the nave of Canterbury Cathedral) and this figure is certainly pagan in origin, and celebrates renewal and seasonal resurrection. As Mike Harding points out in his book “The Green Man”, the woes of Gilgamesh follows his and Enkidu’s beheading of the Guardian of the Forest. The British Museum houses clay tablets of the story of Gilgamesh which is one thousand years older than Homer or the Bible. They are from Nineva in Iraq. The Rod of Aaron also miraculously flowered, so is clearly meant as a symbol of resurrection. All those elements are also clearly evident in the medieval tale of Sir Gawain and the Green Knight. The pentagon is the fifth and divine platonic solid of Pythagorean mathematics and takes its place as such in Plato’s creation myth “The Timeaus”. What is very surprising is that granite platonic solids have been found in neolithic archeological deposits at Scara Brea in the Orkneys. They date to a thousand years before Pythagoras, himself centuries before Plato. It has always been supposed that the very particular connections between ancient Greek culture, as in for example the evident similarities between the beehive “Tomb of Clytemnestra” and “the Treasury of Atreus” at Mycenae, and the Maes Howe structure in the Orkneys was an influence which came up the Danube and Rhine valleys or by sea in that direction. But these very earliest manifestations suggest that the influence travelled in the other direction, from Celts or Ancient Britons, to Greece and its Italian colonies (where Pythagoras set up his community). The mathematics of phyllotaxis which is the study of the growth of leaves and branches in the structure of trees, is dependent on Pythagorean maths, and its complexity which stretches to infinity in the Fibonacci series, which in its higher registers increasingly accurately converges on the golden section, itself an incommensurate number. This occurs when a number is divided by its preceding integer in the series. The ratio has been known as “divine proportion” and is the system by which trees have evolved to maximise sunlight. The leaves on upper branches grow in such a way that least obscures sunlight on the lower branches. These mathematical ideas became a mainstay of classical Greek and Renaissance ideas of beauty. Some of the neolithic solids from Scara Brae can be seen in the Ashmolean Museum in Oxford and I was made aware of them and their implications by Keith Critchlow (“Time Stands Still” and “Order in Space”). 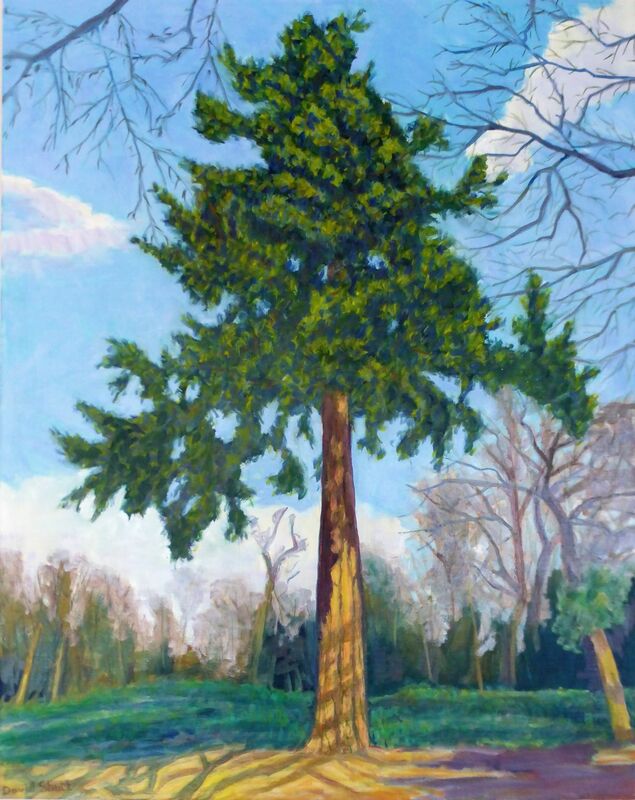 More recently, I have been painting The Buckland Yew through the winter of 2017 to 2018 in Dover. It is a magnificent tree, at least a thousand years old and possibly precedes Christianity in Kent. The yew was a symbol of death long before Christianity. Remarkably it was moved 60 feet to the north west in 1880 so as to enlarge the church of St Andrew built next to it. It weighed 56 tons at the time with a root ball of 18 by 16 feet and was moved with powerful grabs, pulley blocks and rollers, and survived the anxieties of those concerned to (apparently) thrive from the tree surgery done in the move. However, I noticed when working from it that the move had taken it closer to a group of mature yews, which I recently discovered could be equally responsible for its rejuvenation. In “The Hidden Life of Trees” Peter Wohleben describes research of the last 30 years built on that of Dr Suzanne Simard who is Professor of Forest Ecology at the University of British Columbia. She noticed that when birch trees were weeded from plantations of douglas firs the firs seemed to suffer from the loss of their neighbours and started to die. Looking carefully at the forest floor she discovered a vast mycelial network of fungal species which linked the roots of the trees in what she calls a co-operative internet, interchanging carbons and nutrients. 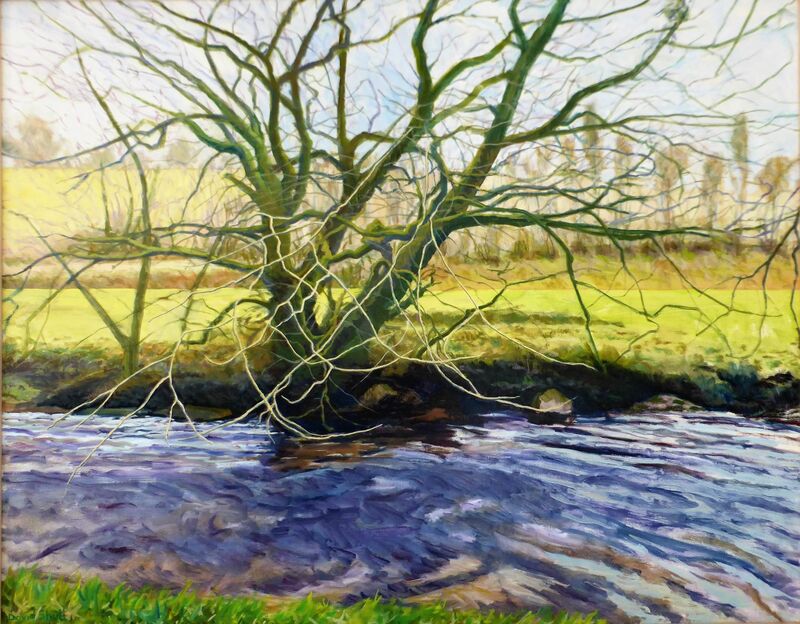 I could see the interconnections between the ancient plane trees in the ravine I paint in the Argolid from the streams both surface and subterranean in the alignments of these huge thirsty trees and it now seems that they are interconnected in other ways. Simard tracked the exchanges of chemicals using spectrometers by which the birches enhanced the early growth of the firs and the energy supply which derived from differing seasonal responses created a mutual support system (there are conifers near the Greek plane trees, including huge cypresses). It emerges that trees support each other in times of stress, for example by giving out signals when being predated by grazing deer (or goats as in my ravine) so not only the victim puts out unpalatable and increased supplies of bitter tannin but has signalled its neighbours through the underground system to do likewise. The herd of animals has to move on to food much further afield. The same kind of response has been identified in beetle, larvae or viral attacks, and signals and nutrients are sent to both same and differing species nearby. The stump of a felled tree can be rejuvenated by flows of sugars from its neighbours and it seems the fungal networks can be very extensive indeed. Trees communicate, co-operate and collaborate in the same evolutionary balance as other organic life forms: a “herding” instinct which is co-operation as much as competition in the struggle for survival and light. Interestingly, it seems we share approximately a quarter of our DNA with trees, because deep in time they are our genetic ancestors (Richard Dawkins, “The Ancestor’s Tale”). In “The White Goddess”, Robert Graves is very emphatic on the direct Greek and Celtic influences: the migratory impacts and very specific spiritual and cultural meanings. His particular interest is the development of meaning in literature, especially poetry. He traces early alphabets from Ogam to Cyrillic in tree lore in the early and connected mythologies of Homeric, Classical and Celtic bardic traditions. The “Tree Alphabet” he outlines in “The Battle of the Trees” is a Druidic tradition whereby each letter of the early alphabet is the initial for a tree related to the Druidic calendar of tree magic, a medicinal and healing practice which figured predominantly in European folklore. The Druidic lore was Romanised as part of the drive to accommodate native religions in the early Empire and the earliest 13 alphabet letters were from the trees particularly sacred to the White Goddess. The number five was also sacred to her, as with Venus (another manifestation of her) goddess and planet, since the planet, when viewed from the earth inscribes its circuit five times in the course of each revolution making a cosmic pentagon. Graves, in his postscript to the book, regards his work as a celebration of a creative goddess banned for centuries by patriarchal Pagan, Christian and Jewish theologians: a celebration of the Mother Goddess of creative inspiration as “a sort of state of being in love”. Much of Graves’ thinking is anticipated in Sir James Frazer’s “The Golden Bough” (1922) after Turner’s painting of that name. It is an immense compendium, originally in twelve volumes, not just of European but Global tree worship and healing traditions. What was initially animism turned to polytheism whereby spiritual beings become independent woodland forest spirits. The tree ceases to be regarded as a conscious living thing, but becomes inert and hence tenanted by an independent supernatural being: no longer a tree soul but a forest god such as the one Gilgamesh beheaded. In Turner’s painting the nymph/goddess of Nemi holds a branch (the sacred bough) and a sickle and is bathed in luminous light in the stream which feeds the lake of Nemi. She is the Artemis/Diana manifestation of the White Goddess and further back in the painting nymphs or vestal virgins dance in the sacred grove. Nearby, are what appear to be either funerary monuments or a ruined temple. The image resonates with the gorge in which I paint which is sacred to Pagan and Christian deities. There are ruined chapels and temples above and along it, dedicated to, for example Isis, and Pan and a major classical temple at the mouth of the gorge dedicated to Hippolytus, where the historical Hippolytus lived. Frazer discusses his links to the goddess of Nemi, as an “underground” fertility cult embracing a tragically abbreviated (sacrificed) life, much as the priest kings of Nemi. When I paint the willow tree on an island in The Thames near Cookham, I cannot help thinking of what Stanley Spencer said, “You can’t walk by the river at Cliveden Reach and not believe in God”, with which I can completely identify and empathise, even if I have no belief in a divine being. Cezanne said very similar things. But I also hold with the Zen notion of essence, as in the story of child and parent looking into a meadow. The child asks, “Is that a horse?” to which the parent replies, “No, that is just what we call it.” I think pictorial construction (to put it drily) has always been wary of over conceptualisation, when we often give precedence to the literary over the visual. Furthermore, as E H Gombrich has convincingly argued, the visual encapsulates concepts, being neither true nor false, but are an aid to description. Put simply, you have to have an idea of what you are painting about. But the more you work the more complicated (and resonant) the idea becomes.